Hey! Welcome to another article that’s gonna be a look at the story aspect of the game. You probably don’t know me yet, but I will team up with Joe Dyer to bring you two articles trying to shed some light on what’s happening and gonna happen on Ravnica, including in the third set. So, as most of you probably already know, the current Ravnica sets are building up to a third set which is gonna feature the (very) recurring villain of the last ten years of magic. Nicol Bolas will finally be setting his plans, years in the making, into action… Today we will go back on the Grixis Elder Dragon planeswalker’s story that we know of, hopefully bringing you up to speed on everything, even if you’re not that familiar with him. 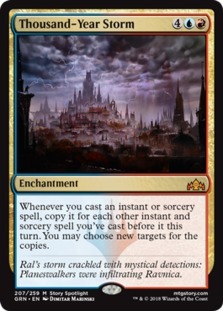 Next week, we’re gonna share with you our predictions and information on Ravnica itself. But to make informed predications, we first need information. So let’s go through the dragon’s involvement in the story, for each of his direct or indirect appearances. Here’s a list of those, in chronological order for the story. We’ll go rapidly through each and every one of these items, and evaluate their relevance to the current story, and our speculations, passing rapidly over irrelevant tidbits and taking more time for more directly relevant stories. Let’s start by going rapidly through the pre-Mending stories. If you’re unfamiliar with Magic’s story, the Mending is an event that modified the rules of Magic’s multiverse after the end of the Time Spiral block. 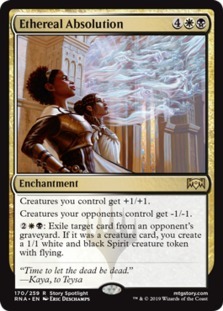 It depowered all planeswalkers from immortal godlike beings to the very much mortal (for the most part) still somewhat powerful mages they’re now. At the same time, the barriers between worlds thickened, and some magics and technologies that relied on that stopped working, like most interplanar portal technologies. 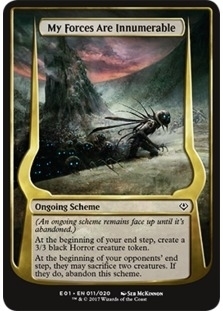 Nearly all we’ve seen of Bolas’s schemes after the Mending had the goal to increase his power towards his former status and higher if possible, so there’s very little chance he was plotting anything toward this end before the Mending even happened. We’re gonna assume in all this article (as well as next week’s) that Bolas hasn’t seen the future. It wouldn’t make much sense to have a story at all otherwise. The dragon's tale starts tens of thousands of years before the Mending, when Nicol was born of The Ur-Dragon along with his siblings and from the same egg as his twin brother, Ugin, not yet a spirit dragon. The twins are weaker than their other siblings due to sharing an egg, and some of the other elder dragons bullies them. Even so I began to think again of Ugin, wanting to share this glory with another, or at least to forgive him, to hear how he might at last acknowledge how far I had come. I am not a selfish creature. 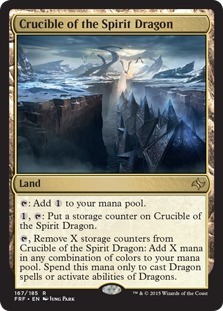 It seemed churlish to withhold this knowledge from Ugin, even if he could never manage to duplicate the planeswalking I had achieved, for at that time I did not yet understand how a peerless spark separates we rare Planeswalkers from the unworthy others of sapient life for whom untold worlds will lie forever out of reach. Then I understood: Arcades was disparaging me, hoping to make me lose my temper as I would have done when I was young and volatile. But I was bigger than that. Much, much bigger. I was a Planeswalker, first and only one of my kind. To rule in Dominaria was all very well for a small-minded despot like Arcades, while I had grown as far beyond him as he was beyond pathetic, weak, short-lived humans. Nicol almost immediately seeks Ugin, and considers planeswalker above all others… And himself as the only planeswalker. It gives us an insight towards Bola’s character and motivations. Bolas seeks power and deference in all things, wants to be above all others. The one he wants to prove himself the most to is his twin, Ugin… But Ugin is the person who never “recognized” his achievements, angering him. 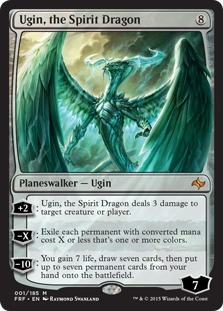 Because of that, Bolas ‘kills’ Ugin in their meditation realm (a small plane Bolas kept to this day as his base of operations), and Ugin comes back as the spirit dragon we know. Other than that characterization, very little of what happened then is relevant to our current story. 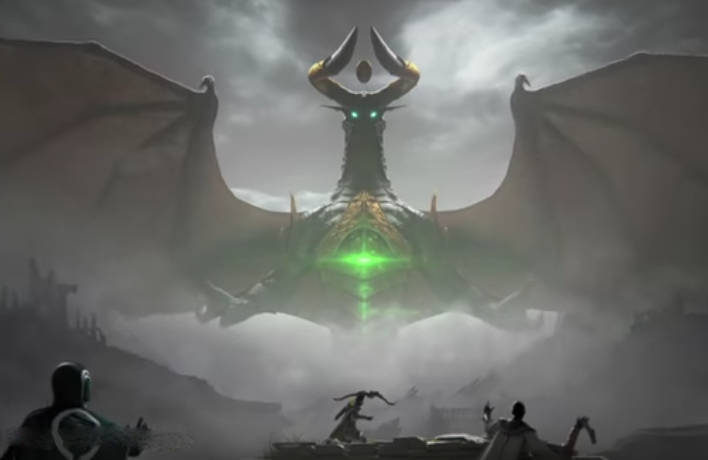 After that, we know that Bolas fights a leviathan Planeswalker next to the Dominarian continent of Madara, around twenty thousand years ago. Everything that we know about this fight is through Leshrac, a planeswalker himself who learned about it from someone else. An unreliable source at best. According to him, the fight lasted a month, shattered the continent and was the first planeswalker duel (that last part is obviously false, since we know Ugin and Bolas fought). 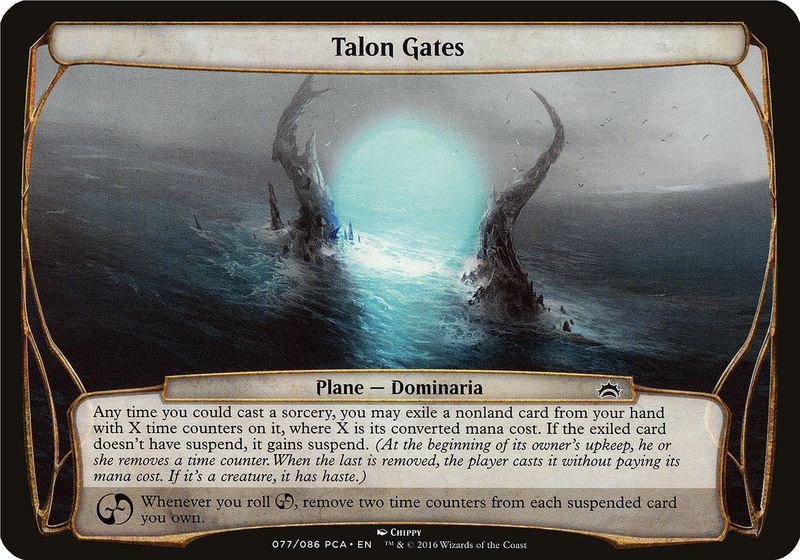 Bolas then ate the leviathan to absorb its power, leaving only two giant talons that became a landmark known as the Talon Gates. The fight also created the first space-time rift on Dominaria. It’s all irrelevant in today’s story. At some point between that fight and Fate Reforged’s story (which is a flashback more than a thousand years in Tarkir’s past) Bolas gained a thingy floating between his horns, the Gem of Becoming, that we have no idea of the purpose or function of. Might be relevant, might not, we’re not gonna try to force it in every theory we have. 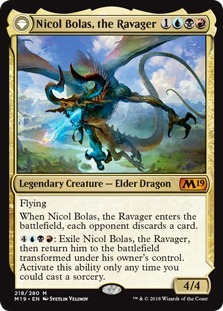 We don’t know when he got it, but we know that every card of Bolas before becoming a planeswalker doesn’t feature it, he has it by Fate Reforged’s story and on Nicol Bolas, the Arisen, which is supposed to be him after his sparking. Thousands of years after his fight against the leviathan—around 1280 years ago—Nicol and Ugin fight once again, on Tarkir this time. Ugin lured his brother there to try to get him to Ixalan and trap him with Azor’s Immortal Sun. 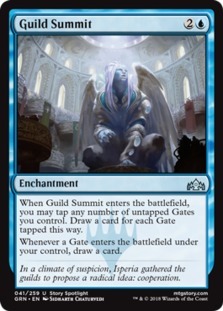 Ugin allied with Azor, the Lawbringer so that they would make the Immortal Sun, embedding the sphinx's planeswalker spark into it in the process. The Immortal Sun is an artifact made to stop planeswalkers on the same plane as it from planeswalking. Unbeknownst to Ugin, Nicol prepared for the fight and has an agent on Tarkir ready to tip the scales in his favor, Yasova Dragonclaw. Bolas once again defeats Ugin, and leaves him for dead… Which he would have been without the intervention of Sarkhan Vo, having appeared / come from a future that doesn’t exist (time travel is complicated) to hide Ugin’s body into a cocoon of hedrons and help him slowly regenerate. During that fight, Nicol also gets information on Ugin, his plan to entrap him on Ixalan, the Immortal Sun, the Eldrazi Ugin entrapped on Zendikar, and probably a few other things. A few years after, he comes back to make sure Ugin is truly dead this time… To find hedrons blocking him. It appears that the Hedrons were made by Ugin with anti-Bolas properties, which isn’t all that surprising. All and all, he tries to manipulate humans into telling him if Ugin is truly dead and into destroying the hedrons, but is fended off by a bluff. Now why does this matter? We’ll see in a moment. This fight is pretty irrelevant in regards the current story, but also sets up a few pieces for it to be possible. Bolas knows of the Immortal Sun and of the Eldrazis... But also that he might not know Ugin's still alive and running around. Next in line, we have the time where the Elder Dragon went back to Madara on Dominaria, and ruled it as God-Emperor. That ended pretty poorly for him, with Tetsuo Umezawa killing him. His soul / spirit is trapped in the local time rift, and that is very unlikely to be relevant for our theories. Later, during the events of the Time Spiral block, this soul / spirit manipulates Venser and Radha into essentially bringing him back to life. Teferi’s there, they fight, Teferi loses, Bolas seeing the threat posed by the rifts to all the multiverse lets them go try to fix them while he takes care of the one on Madara, using the essence of another planeswalker, Leshrac, to do so. He also takes revenge on all of the members of the Umezawa lineage, and Tetsuko Umezawa is still running to this day (Time Spiral took place around 60 years ago). He nets a neat magical trinket, the mask of the Myojin’s of Night’s Reach, allowing him to steal and use black-magic based abilities and power… But this is very unlikely to be something we see come back. 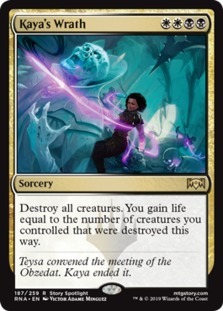 The only important thing in all of this is that Teferi and Bolas know each other and already fought. Soon after that, the last time rift is closed over Otaria, and the Mending starts. 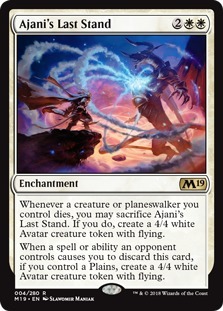 As the Mending starts to take effect, and Bolas starts losing his powers, he rushes to a mostly devastated plane, Amonkhet, overpowers its eight gods, corrupts three, brainwashes four and recruits the last one. He sets up a super-zombie factory there to use later. It is somewhat relevant, but we're gonna talk about Amonkhet a little more later. A few dozen years later, he ‘helps’ Liliana broker deals with four demons (Griselbrand, Kothoped, Soul Hoarder, Razaketh, the Foulblooded and the Demonlord Belzenlok) to give her some of her pre-Mending power back, as well as eternal life and youth. He hides a few things in the fine print, but we’ll also get back to that later. Somewhere in there, he also destroyed Vivien Reid’s homeplane, Skalla. It might come up here if Vivien herself is involved in Ravnica's story. It is possible, and even hinted at by this art during an advertisement for Magic Arena. Then, we finally get to the meat of entire blocks. 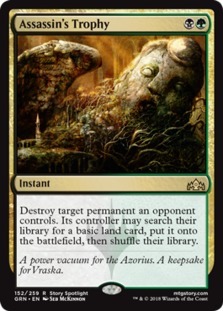 The Shards of Alara block featured him as its villain, as he organized dissent and conflict (reminds you of something?) in all five shards of Alara to provoke its Conflux. He planned to absorb the Maelstrom’s energy to power himself back, and stop the slow decay of his magic that his now mortal body couldn’t hold. But as he had taken in most of the energy, Ajani Goldmane intervened and created a soul duplicate of Bolas from the Maelstrom’s remaining energy. It was successful at driving off the dragon without making it very clear if he had retained all that power. Whether he kept that power or not is probably independent of his schemes on Ravnica, except for the power at his disposal and his previous encounter with Ajani. Then we’re off to some books-only (and mostly unreliable) plot, regarding Tezzeret, Jace, Liliana and the Infinite Consortium. 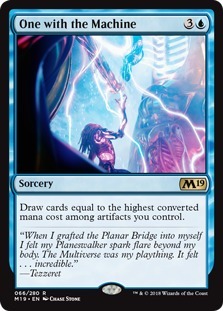 The Infinite Consortium is a multiplanar network of intelligence gathering, assassination and everything you can imagine under Bolas’s orders, of which Jace and Tezzeret both were members at one point. 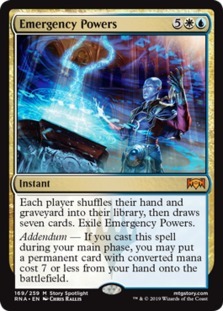 Long story short, Tezzeret ‘stole’ it from Bolas, then Jace stole it from him and left Tezzeret to die on Kamigawa, mind crushed, and the network has been dissolved since as far as we know. All of that might have an off-mention or two on Ravnica, especially in the reactions of Jace, Liliana and Tezzeret to each other, but the Consortium itself won't matter. Chandra’s manipulation starts in The Purifying Fire, a novel available to buy both digitally and in paper form. The Zendikar block is next (well, some parts overlap or are before some of the books right before), and Nicol Bolas’s antics are to a minimum here. 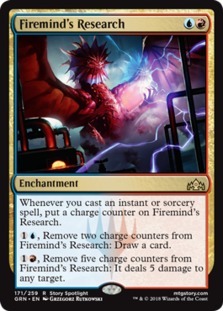 He “just” sets up Sarkhan there in the Eye of Ugin... And manipulates Chandra into learning how to make Ghostfire (Ugin's signature magic) and go to the Eye… With Jace on her trail. The three of them trigger the release of the Eldrazis. Nothing dramatic. This ultimately ends with the formation of the Gatewatch, which is relevant… And might play into Bolas’s plans, since the reason invoked in the art book(s) for him to free the Eldrazis was to “see how planeswalkers would react against such a threat.” More on that on Amonkhet. While all of that happens, Bolas retrieved Tezzeret’s body from the villagers that killed him on Kamigawa, and somehow resurrected him, reconstructed his mind and soul well enough that he’s still a planeswalker. 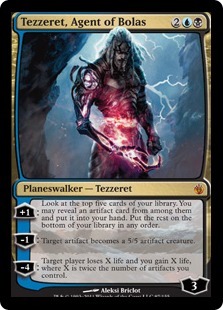 Tezzeret is now also enslaved to Bolas, and bears his mark on his face as a horns-shaped tattoo. The dragon uses him for some dubiously canonical antics on Alara (Test of Metal), then sends him off to New Phyrexia, to observe this potential threat / tool without interfering. 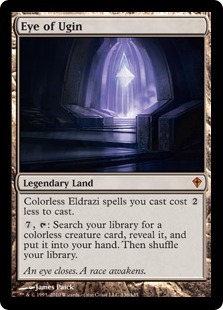 After Tezzeret's return from New Phyrexia (where he utterly failed at the "not interfering" part of his mission), Bolas relocates him to Kaladesh, where Tezzeret becomes Supreme Judge of Ghirapur’s Inventors' Fair, his mission being to secure a working Planar Bridge for his master. For once, he manages to do it, stealing the device from Rashmi, Eternities Crafter and fusing it with himself. Having now a (mostly) functional Planar Bridge, Bolas goes to collect his army of Eternals on Amonkhet — a few thousand loyal, obedient, highly trained and tactically trained warrior-mages. Covered in lazotep (a blue mineral from Amonkhet), they are able to cross the Bridge, since it doesn’t accept organic matter. He will probably use this army to tip the scales on Ravnica, which is pretty relevant, but doesn’t really affect his larger plan. He has an army. But he also defeats the Gatewatch (minus Ajani) there, in a very flashy way… And keeps them all alive, on purpose. They might be a part of what he has planned next, or he might simply want to toy with them some more. But he released the Eldrazis to get them to organize, so the former is more likely. At the same time, we learn that Bolas collected a debt from Ral Zarek, and set him up on a (still kinda) mysterious Project. We will talk a little more about this next week, as we get more information from Ravnica’s art book, but we already knew that Ral Zarek created the Lightning Bug project, a system able to locate planeswalks on Ravnica as well as their origin or destination. All of that is, of course, very relevant to the Ravnican story and will be important pieces in the coming puzzle. 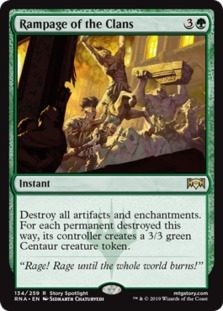 He also recruited Vraska, an assassin from Ravnica, to go fetch the Immortal Sun on Ixalan for him, a powerful artifact empowering the abilities of whoever uses it… And stopping all planeswalking on the plane it’s on. There, she meets an amnesic Jace and befriends him, then finds the Immortal Sun, guarded by none other than Azor, Supreme Judge and Parun (original Guildmaster) of the Azorius guild, ex-planeswalker and creator of the Immortal Sun (using his own pre-Mending planeswalker spark to make it) and Ravnica’s Guildpact, among other things. Jace uses the Guildpact to exile an uncooperative Azor to an abandoned island on Ixalan, but also learns of Ugin's plans to lure Bolas there... And understands Bolas’s involvement in Vraska's mission (he got back his memories shortly before). Jace hides and replaces Vraska’s memories of him so that Bolas doesn’t find out he was there. 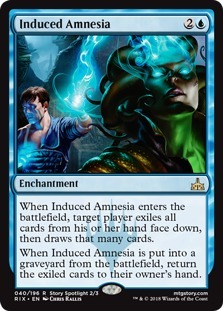 He plans to give her back her memory at a turning point on Ravnica to turn her against Bolas. We also learn that Ravnica is naturally heavy on hieromancy, or law magic, and that the Guildpact is only a way to harvest it. Vraska then “calls” Tezzeret, who uses the Planar Bridge to get the Immortal Sun out of Ixalan, and at Nicol Bolas’s disposal. As a reward, Bolas makes sure Jarad, Golgari Lich Lord the then Golgari Guildleader, is imprisoned and given to Vraska to do as she see fits, and her leading the Golgari. This is all, of course, as many other important pieces of the puzzle. During Dominaria’s story, he’s not involved before the end. 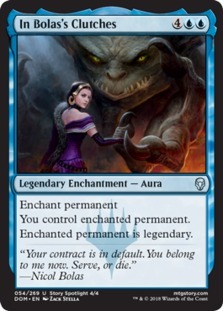 After Liliana killed the last demon she owed, the Demonlord Belzenlok, a clause in her contract activates and makes her obey Nicol Bolas, the contract’s broker, who shows up to collect his new servant. He will surely make use of her, especially given that the third set’s banner features her, but he had no way to plan for her to kill her last demon right before he enacted his plans on Ravnica, so whatever role she will play there won't be a crucial one. Alright, we’re up to the current story: Ravnica! On Ravnica, up until now, we’ve seen Nicol Bolas use the same strategy he did again and again, Divide and Conquer. Back before the Elder Dragon War, he did it on a town. On Alara, he created conflict within each shard. Even on Amonkhet, he pitted friends against each other in the last Trial, and gods against each other during the Hours. It shouldn’t be a surprise then that he placed his pawns at the top of exactly half the guilds, and that tensions are rising in the city. Nicol Bolas wants a war, and a war he will get. As we were writing this article, a big announcement was dropped. The name of the third set for this year. This shook up a few theories, and shined light on a few others… But that’ll be the subject of next week’s article. The cooperation of half the guilds and/or a war between Ravnica’s guilds. Our theories will be published next week… But in the meantime… What are your theories on Bolas’s plans? Do you think we already forgot something? Have thoughts about today’s article? Tell us in the comments, and until next week… Good bye!